Contraction of a muscle fiber is a complex process that involves a number of rapid structural and chemical changes within the muscle fiber. The molecular mechanism of contraction is explained by the sliding-filament model. In order for a muscle fiber to contract it needs to first be stimulated or “excited” by a somatic motor neuron. The pairing of a nerve impulse (an electrochemical signal) and physical contraction of the muscle fiber is referred to as excitation-contraction coupling. Contraction of a muscle fiber is initiated when the terminal bouton of an activated somatic motor neuron releases ACh into the synaptic cleft. Acetylcholine binds to ACh-receptors on the motor end plate causing the formation of a muscle impulse (similar to the nerve impulse), that spreads over the sarcolemma and is carried into the sarcoplasm by the T tubules. Stimulation of the sarcoplasmic reticulum from the nearby T tubules triggers the release of Ca2+ from the sarcoplasmic reticulum into the sarcoplasm. The steps of the contraction cycle. Step 1-Ca2+ within the sarcoplasm binds to troponin, which then causes the tropomyosin strands to change position, exposing the myosin binding sites on actin molecules. Step 2-With the myosin binding sites exposed, each myosin head binds to a myosin binding site to form a cross-bridge with the actin molecule. Step 2-While the cross-bridge is formed the inorganic phosphate detaches, causing the myosin head to pivot and exert a power stroke that pulls the thin myofilaments toward the M line of the sarcomere. ADP detaches during the pivoting of the myosin head. Step 3-The power stroke causes sliding of the myofilaments past one another, and the sarcomere shortens. 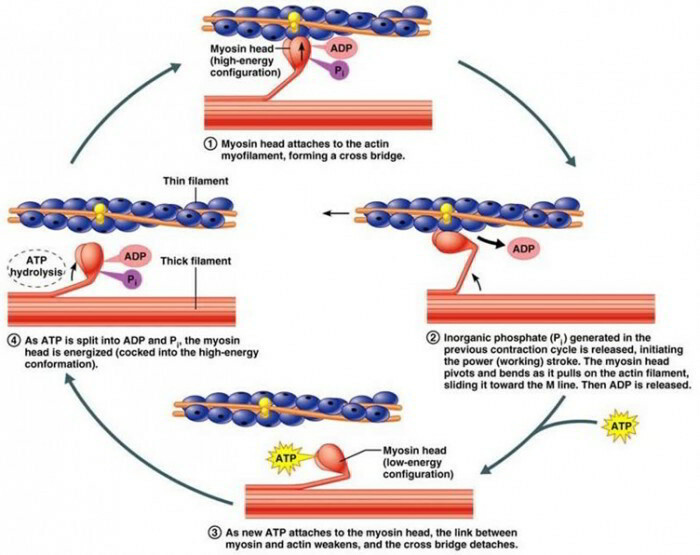 Step 4-A new molecule of ATP binds to the myosin head, causing myosin to release the actin molecule. Step 5-The detached myosin head returns to its relaxed position and then becomes energized after hydrolyzing the ATP to ADP and Pi. Step 6-This returns us to Step 2, wherein the energized myosin head reattaches to a new binding site on actin, releases Pi, and uses its energy to repeat the power stroke in Step 2. This cycle rapidly repeats itself to maintain a contraction as long as ATP and Ca2+ are available. When the somatic motor neuron stops stimulating the muscle fiber, an enzyme in the synaptic cleft called acetylcholinesterase begins decomposing ACh. The breakdown of ACh prevents continued stimulation of the muscle fiber. Consequently, Ca2+ is no longer released from the sarcoplasmic reticulum and is instead actively transported from the sarcoplasm into the sarcoplasmic reticulum. This causes Ca2+ to unbind troponin, which allows tropomyosin to move back over the myosin binding sites and stop the contraction cycle. The thin and thick myofilaments then slide back to their original positions, moving the Z lines apart, lengthening the sarcomeres (muscle relaxation). Carefully study, which illustrates the sliding-filament model of muscle contraction. Note the configuration of thin myofilaments and thick myofilaments in a relaxed muscle fiber, how they interact in the steps of the contraction cycle, and how contraction is powered by ATP. Although the sliding myofilaments produce contraction (i.e., the shortening of the sarcomeres), the lengths of the thin myofilaments and thick myofilaments remain unchanged. The energy for muscle contraction comes from ATP molecules in the muscle fiber. Recall that ATP is a product of cellular respiration. However, there is only a small amount of ATP in each muscle fiber. Once it is used up, more ATP must be formed in order for additional contractions to occur. While a muscle fiber is relaxed it uses cellular respiration to release energy from nutrients and transfers that energy to the high-energy phosphate bonds of ATP. Once there are sufficient amounts of ATP available in the muscle fiber, the high-energy phosphate is transferred to creatine to form creatine phosphate (CP), which serves as a storage form of readily available energy. The resulting ADP is then reconverted to ATP using cellular respiration. Muscle contraction quickly reduces ATP levels, resulting in the high-energy phosphate group being transferred back from the creatine phosphate to the ADP, forming ATP, which can then be used to power additional contractions. There is four to six times more creatine phosphate than ATP in a muscle fiber so it is an important source for immediate ATP formation without waiting for the slower process of cellular respiration. However, it can also be depleted in under 10 seconds in a muscle that is contracting repeatedly. Cellular respiration is the process of breaking down glucose in two steps: (1) anaerobic respiration in the cytosol and (2) aerobic respiration in the mitochondria. Due to the need of a constant supply for glucose to generate ATP, muscle fibers store large amounts of glucose as muscle glycogen. Whether or not a muscle fiber uses just anaerobic respiration or also includes aerobic respiration depends on the availability of oxygen. During periods of strenuous exercise such as weight lifting, muscle fibers will employ mostly anaerobic respiration because the respiratory and cardiovascular systems cannot provide oxygen to muscle fibers quickly enough to maintain aerobic respiration. The muscle fibers will break down glycogen to glucose and glucose to pyruvic acid, in a process called glycolysis, forming only a small amount of ATP per molecule of glucose. Since anaerobic respiration is not favorable in muscle fibers, muscle tissue is adapted to facilitate aerobic respiration. Muscle tissue possesses a large number of blood vessels and obtains large amounts of oxygen from the blood via hemoglobin, the red pigment in red blood cells. Muscle fibers also have a similar pigment, myoglobin, which stores oxygen within the sarcoplasm and helps transfer oxygen to the mitochondria. In the same manner that creatine phosphate stores extra energy in times of muscle inactivity, some of the oxygen carried to muscle fibers is transferred from hemoglobin to myoglobin and stored for later use during periods of muscle activity. This function of myoglobin reduces the muscle fiber’s dependence on oxygen carried to it by the blood at the onset of exercise. During inactivity or light to moderate physical activity (e.g. endurance training), muscle fibers receive sufficient oxygen to carry on the aerobic respiration. This process involves the breakdown of pyruvic acid produced in glycolysis, or other organic nutrients, into carbon dioxide and water. In contrast to anaerobic respiration, aerobic respiration provides a large amount of ATP per molecule of glucose. When a muscle fiber utilizes anaerobic respiration, such as during strenuous exercise, it accumulates lactic acid and depletes its ATP, CP, and oxygen stores. To restore resting conditions within a muscle fiber after activity ceases, respiratory and heart rates remain elevated to support excess post-exercise oxygen consumption or EPOC (formerly oxygen debt). EPOC is the amount of oxygen required to replenish myoglobin and to produce the ATP needed for the metabolism of the lactic acid in the liver, heart, and skeletal muscles and the restoration of ATP and creatine phosphate in the muscle fibers. If a muscle is stimulated to contract for a long period, its contractions will gradually decrease until it no longer responds to stimulation. This condition is called fatigue. Although the exact mechanism is not known, several factors seem to be responsible for muscle fatigue. The most likely cause of fatigue in long term muscle activity is a lack of available nutrients, such as muscle glycogen and fatty acids, to utilize for ATP production. Exercise has a profound effect on skeletal muscles. Strength training, which involves resistance exercise such as weight lifting, causes a muscle fiber to be repetitively stimulated to maximum contraction. Over time, the repetitive stimulation produces hypertrophy-an increase in muscle fiber size and strength. The number of muscle fibers cannot be increased after birth. Instead, hypertrophy results from an increase in the number of myofibrils in muscle fibers, which increases the diameter and strength of the muscle fibers and of the whole muscle itself. In comparison, lack of repetitive stimulation to maximum force causes muscular atrophy, which is the reduction in muscle size and strength due to loss of myofibrils. Atrophy can be caused by damage to the nerve stimulating the muscle or lack of use, such as when a limb is in a cast. Aerobic exercise, or endurance training, does not produce hypertrophy. Instead it enhances the efficiency of aerobic respiration in muscle fibers by increasing (1) the number of mitochondria, (2) the efficiency of obtaining oxygen from the blood, and (3) the concentration of myoglobin. Heat production by muscular activity is an important mechanism in maintaining a normal body temperature. Muscles are active organs that form a large proportion of the body weight. Heat produced by muscles results from cellular respiration and other chemical reactions within the muscle fibers. Recall that 60% of the energy released by cellular respiration is heat energy. Muscle generates so much heat that exercise leads to an increase in body temperature that requires sweating to help remove heat from the body. On the other hand, the major response to a decrease in body temperature is shivering, which is involuntary muscle contractions. When studying muscle contraction, physiologists consider both single-fiber contraction and whole-muscle contraction. It is possible to remove a single muscle fiber in order to study its contraction in the laboratory. By using electrical stimuli to initiate contraction and by gradually increasing the strength (voltage) of each stimulus, it has been shown that the fiber will not contract until the stimulus reaches a certain minimal strength. This minimal stimulus is called the threshold stimulus. Whenever a muscle fiber is stimulated by a threshold stimulus or by a stimulus of greater strength, it always contracts completely. Thus, a muscle fiber either contracts completely or not at all-contraction is not proportional to the strength of the stimulus. This characteristic of individual muscle fibers is known as the all-or-none response. Much information has been gained by studying the contraction of a whole muscle of an experimental animal. In such studies, electrical stimulation is used to cause contraction, and the contraction is recorded to produce a tracing called a myogram. If a single threshold stimulus is applied, some of the muscle fibers will contract to produce a single, weak contraction (a muscle twitch) and then relax, all within a fraction of a second. After the stimulus is applied, there is a brief interval before the muscle starts to contract. This interval is known as the latent phase. Then, the muscle contracts (shortens) during the contraction phase and relaxes (returns to its former length) during the relaxation phase. If a muscle is stimulated again after it has relaxed completely, it will contract and produce a similar myogram. A series of single stimuli applied in this manner will yield a myogram. If the interval between stimuli is shortened so that the muscle fibers cannot completely relax, the force of individual twitches combines by summation, which increases the force of contraction. Rapid summation produces incomplete tetany, a fluttering contraction. If stimuli are so frequent that relaxation is not possible, tetany results. Tetany is a state of sustained contraction without relaxation. In the body, tetany results from a rapid series of nerve impulses carried by somatic motor neurons to the muscle fibers that results in a prolonged state of contraction. Tetany for short time periods is the usual way in which muscles contract to produce body movements. Unlike individual muscle fibers that exhibit all-or-none responses, whole muscles exhibit graded responses-that is, varying degrees of contraction. Graded responses enable the degree of muscle contraction to fit the task being performed. Obviously, more muscle fibers are required to lift a 14 kg (30 lb) weight than to lift a feather. Yet both activities can be performed by the same muscles. Graded responses are possible because a muscle is composed of many different motor units, each responding to different thresholds of stimulation. In the laboratory, a weak stimulus that activates only low-threshold motor units produces a minimal contraction. As the strength of the stimulus is increased, the contractions get stronger as more motor units are activated until a maximal stimulus (one that activates all motor units) is applied, which produces a maximal contraction. Further increases in the strength of the stimulus (supramaximal) cannot produce a greater contraction. The same results occur in a normally functioning body. The nervous system provides the stimulation and controls the number of motor units activated in each muscle contraction. The activation of more and more motor units is known as motor unit recruitment . Even when a muscle is relaxed, some of its muscle fibers are contracting. At any given time, some of the muscle fibers in a muscle are involved in a sustained contraction that produces a constant partial, but slight, contraction of the muscle. This state of constant partial contraction, called muscle tone, keeps a muscle ready to respond. Muscle tone results from the alternating activation of different motor units by the nervous system so that some muscle fibers are always in sustained contraction, as seen in. Muscle tone of postural muscles plays an important role in maintaining erect posture.